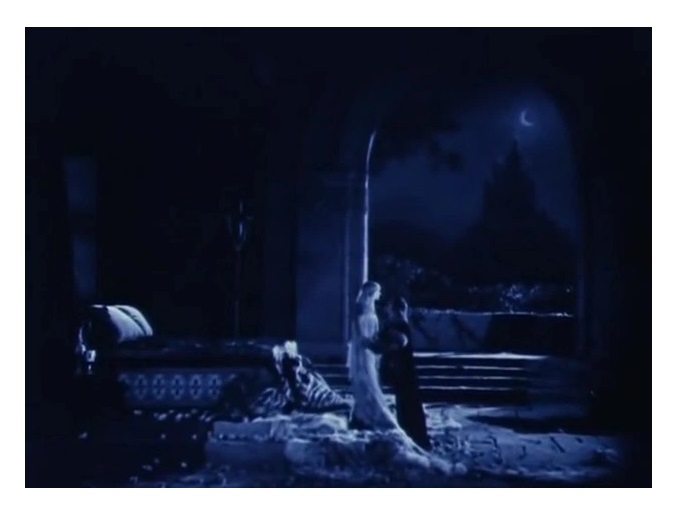 The story of beloved folk hero Robin Hood (Douglas Fairbanks, The Black Pirate), who according to the legend stole from the rich in order to help the poor, and battled nefarious Prince John (Sam De Grasse, Our Dancing Daughters) while romancing the beautiful Lady Marian (Enid Bennett, Intermezzo: A Love Story). Super-entertaining silent edition of the oft-told tale. The good news is that Robin Hood, directed by Allan Dawn (Sands of Iwo Jima and The River’s Edge), compares favorably to the excellent 1938 movie with Errol Flynn, and it is infinitely superior to the Disney versions (live-action and animated), and the 1990s movie, with Kevin Costner (I haven’t seen the Russell Crowe movie yet). 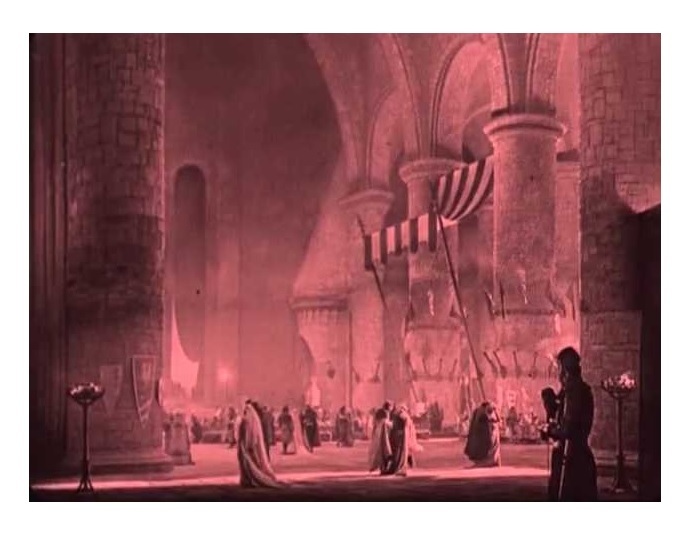 This lavish production, one the most expensive films of the silent era, is different from other versions in one aspect: it tells the story from the very beginning. Robin Hood opens with a happy and joyful England under the reign of fair-minded Richard the Lion-Hearted (a slim Wallace Beery, The Champ). Our hero is just one of many knights serving the crown. You get to see Hood’s evolution from timid aristocrat to fearless avenger. The first half does a great job establishing the characters and relationships. The second half is mostly composed of swordfights, but the elaborate action set-pieces are exciting because you were given time to develop feelings for the characters. 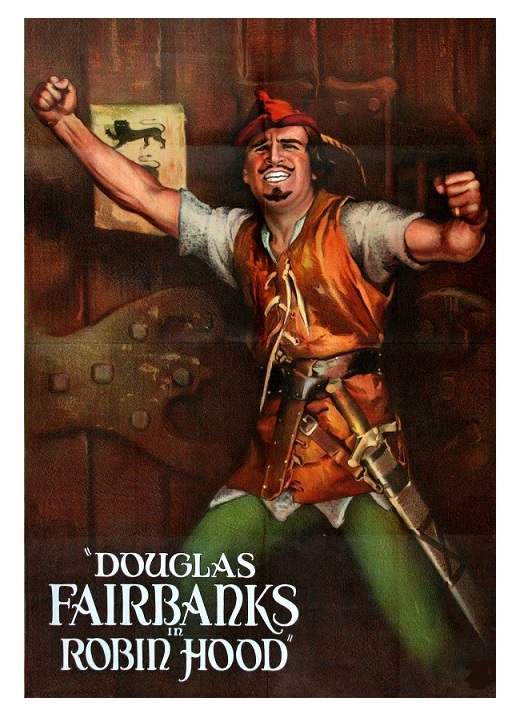 I just love Douglas Fairbanks! He moves around like a jumping jelly bean and never loses that wonderful smile of his. I’m still a Flynn kind of guy, and being a 1970s & 1980s kid, I have a soft spot for Harrison Ford (Raiders of the Lost Ark), but Fairbanks ranks high on my list of favorite action stars. It’s a bit hard to accept the flamboyant Fairbanks as a shy English knight, but once he starts using the bow, arrow and sword he is in his element. Even Flynn pales in comparison to Fairbanks’s daring acrobatics. The cast includes Alan Hale as Little John. He plays, of course, same role in The Adventures of Robin Hood and Rogues of Sherwood Forest. Film debut of Ann Doran (Rebel Without a Cause). As I said before, this is an expensive production. The incredible sets are by Anton Grot (The Private Lives of Elizabeth and Essex), William Cameron Menzies (For Whom the Bell Tolls) and Lloyd Wright (architect Frank Lloyd Wright’s son). Future film director Mitchell Leisen (Easy Living, Hold Back the Dawn, etc.) designed the costumes. 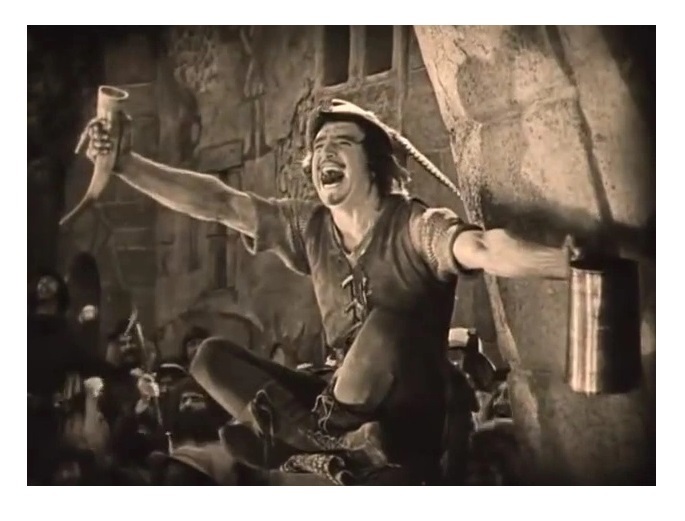 If you are not well-versed in silent movies, Robin Hood is a real good place to start. The movie is funny, engaging, the action-scenes are well-staged, and Fairbanks is irresistible. Tinted, 127 minutes, Not Rated. What a great review! I LOVE this version. Still the very best. Thanks! Isn’t it great fun? I enjoyed this immensely. This is one great version of the legend, even if it doesn’t have Morgan Freeman in it! (He had costars?) Many thanks for such a great writeup — I must dig out my copy for a rewatch: it’s been years.